My name is Jack Longman and this is The BiteSize Jacketendo Review. Whereas The Jacktendo Review is my very own two-in-one game review that caters to all kind of readers as it consists of both a fast and a short review and a slow and long one, the BiteSize version skips the lengthy review. Instead it is a singular, smaller review that wastes no time in getting to the point and undergoing The BiteSize Jacktendo Review today, is the newly Nintendo ported Plantera for both Wii U and 3DS. *To anyone who’s here just for the score, you’ll find it near the end of the review. 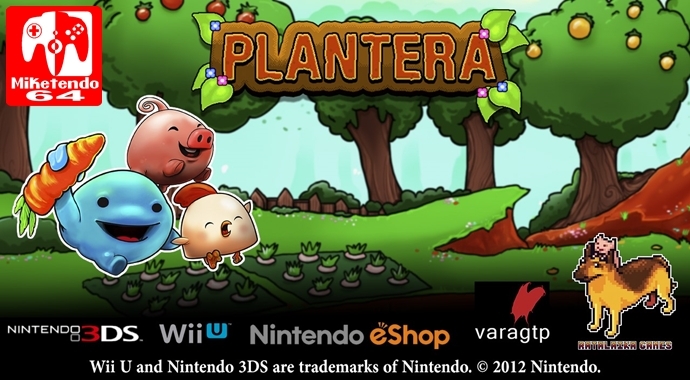 Developed by Swedish game developer Varagtp Studios and then ported to the Wii U and 3DS by Ratalaika Games, Plantera is essentially a point and click game that sees you grow your garden, whilst doing battle against the wildlife, who seek to steal your goods. As far as a story goes, just like Hyperlight EX, there isn’t one and that’s not necessary a bad thing. Just because Plantera is limited to just the one mode, and could be considered as off putting to gamers, due to having a low amount of content, it doesn’t mean you should write it off just yet. What Plantera does have is the means for players to come home from work, feeling incredibly stressed and play a game that requires less attention than most. Sure you could come home from work and play a bit of Call of Duty, but just how much stress do you think you can relieve before a random online player kills you for the umpteenth time and stresses you further. You don’t get that with Plantera. With Plantera you get to let your mind wander and make progress as your workers make your money. To prevent such attacks, players can either handle the threat themselves, or employ a bunch of adorable doggies and scarecrows who will do the work for them and will continue to do so even when the player steps away from the game and turns their device of. To reiterate, you can turn Plantera off, and come back the next day and find everything as you left it, and a whole load of money your workers have been able to obtain for you, from maintaining your “garden.” And just in case you are one of those competitive gamers who need a reason to play a game, Plantera has in-game achievements, so if the cartoony, cutesy graphics don’t win you over, maybe the achievements will. Now that pretty much covers Plantera as a whole, so how about we move on to version differences. Plantera on Wii U could not be any more different than Plantera for 3DS if it tried. Not only is the screen bigger (obviously), which allows you to see more, but the Wii U version of the game feels smoother, but it has more expansions than the 3DS version, meaning you can have a bigger garden, but because it is bigger, it gives the impression you have to do less, because compared to the 3DS version with the smaller screen and output display, you constantly feel like you have to work at it, because you’re constantly having to move the screen. Differing experiences aside, with the 3DS’ two screens, one is constantly displaying the garden and a menu, whereas for players playing on the Wii U, they have to turn the TV on if they wish to have their menu displayed. Regardless of what platform you play it on (hands down my preference is the Wii U version), Plantera is a pleasant and affordable title ($4.99) that does support cross-buy, so if you have both a 3DS and a Wii U, you can get the game for both. Plantera is a game to be tried, even if it isn’t your cup of tea. So as far as I am concerned, it is a welcome edition to both platforms so if you are considering buying an indie game this week, buy Plantera. So with this paragraph and everything above said and done, I can now reveal my final score for Plantera on the Wii U deserves a solid 7/10 and a 6/10 on 3DS! Great review Jack! Plantera sounds like a very relaxing game, which definitely sounds more appealing than Call of Duty after a long day, haha.